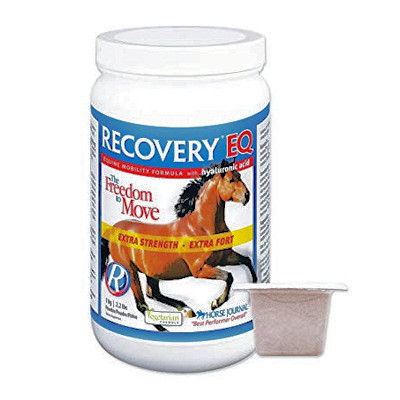 Recovery EQ-HA (Bio-Medica Labs) is an Award-winning HA joint supplement that the Horse Journal called the ''Best Performer Overall'' of all joint supplements tested that contained 100mg of Hyaluronic Acid (HA) per Dose. How does Recovery EQ-HA work? To understand how Recovery EQ-HA helps improve a horse's quality of life, let’s take a look at how cells behave when they are aging and/or damaged by trauma such as injury, surgery or over-training. When a cell is irritated or damaged, or when it begins to age, its membranes break down. As a result, compounds contained within the cell walls are released into the cell matrix. Some of these substances, such as histamine, give rise to inflammation and associated pain. Inflammation is a horse's natural response to injury. Inflammation is characterized by redness, swelling, heat and moderate to intense discomfort. When a joint becomes inflamed, your horse may experience any or all of these symptoms. This can prevent the joint from moving properly, leading to stiffness and loss of function. Researchers have found that the ''diseases of aging''in horses such as arthritis, navicular and laminitis, have similar underlying factors: a decrease in cell stability leading to membrane damage and subsequent release of compounds that promote damage, spasm and inflammation. The ingredients in Recovery EQ-HA work by stabilizing the membranes of the cells, promoting healing of existing damage and helping to prevent further damage. On a practical level, this means quality of life is improved, and you will see your horse experiencing the freedom to move. Recovery EQ-HA orally administered powder contains Nutricol, a proprietary bioflavonoid antioxidant complex from tea and grapes recognized for their health promoting action, hyaluronic acid (HA), glucosamine, MSM, TMG (trimethylglycine) , magnesium, vitamin C and natural vitamin E.
Nutricol is a proprietary bioflavonoid complex containing epigallocatechin gallate (EGCG), theaflavin, proanthocyanidins and resveratrol from Vitis vinifera (grape) and Camellia sinensis (green tea). This formula is exactly the same as RecoveryEQ with the addition of 100mg of hyaluronic acid (non-animal source). Hyaluronic acid is a major component of equine skin, cartilage and synovial fluid and provides a framework to which other joint building structures attach. Recent research has shown that oral administration of hyaluronic acid acts to both lubricate the joint and reduce inflammation. Suggested Usage: Introduce gradually over a two week period to a concentrated dose of ½ scoop per 300 lbs body weight daily. Mix with food. After 30 - 60 days it may be possible to reduce intake to ¼ scoop per 300lbs body weight daily. One full scoop is 26 grams. When oxygen is utilized by the body, it produces a highly reactive ''exhaust''that is damaging to the cells. The reactive molecules in this exhaust are commonly referred to as ''free radicals''or reactive oxygen species (ROS). While some free radicals play a necessary role in the metabolic process, an overabundance of them is believed by many researchers to be a primary cause of cell destruction, inflammation, degenerative disease and aging. Among the diseases attributed to increased free radical action are heart disease, arthritis, cancers, liver disease, cataracts, macular degeneration ,age-related vision loss, diabetes, digestive diseases, auto-immune disease and breathing conditions. The bioactive components of Nutricol have been shown in numerous studies to curb the production of free radicals in animals and in humans. It is proposed that regular use of the product will help reduce the rate of cell damage attributed to free radical action. Recovery EQ-HA is safe to administer to brood mares. Many veterinarians have safely administered RecoveryEQ, reportedly using it as a natural alternative to pergolide, to pregnant and nursing mares over the past 8 years.